And all this will affect darwins return and in fine investors. Thanks for the clarification and for sharing your view. Yes, I agree, ESMA's decision will have an impact on some traders, especially if they trade with high leverage. As I said before, almost every invested darwin provider is trading with a DLeverage under 20, the few above will reduce their risk profile. Dleverage has nothing to do with the REAL leverage. Yes, it does Happy to explain if you need assistance on this. If you trade with a real leverage of 20 the resulting DLeverage will always be below 20. We'll see what hapens in reality; what you mention is the theory. 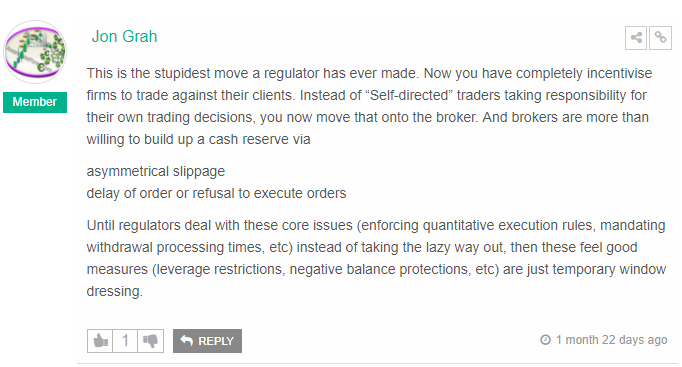 Darwinex announces that he becomes a broker-dealer, not a reaction! At the risk of surprising you, it does not bother me. The pure agency model was a guarantee that Darwinex was not our counterpart. A guarantee that Darwinex's interest was not to make traders lose. But as Darwinex's model is to offer attractive Darwins, and since Darwinex has an excellent reputation, abandoning the pure agency model does not worry me. On the contrary, this leaves the field free for technical optimization to further improve performance during replication. The B-Book is not intrinsically a bad thing, if Darwinex uses it for its customers, it can even become a significant advantage. On the other hand, it seems to me that to obtain a broker-dealer's license, one must have more capital than to just be pure agency? Hum... I am not sure. DLeverage depend of asset volatility. If you trade WTI (XTIUSD) with a leverage of 20, your Dleverage will be very very higher than 20 because volatility is 3 or 4 time bigger than EURUSD. You are absolutely right, @Medialux. Clear but we were speaking about forex majors where the new limit will be 20. I agree, but I think that EURUSD is the reference, and EURUSD is less volatile that many forex majors. This is the bit that surprised me the most from this announcement, I however agree that I'm not worried. In the main having your broker in essence trading against you is obviously not good, encourages them to hit your stops and then people have to start writing in invisible stops and that kind of thing. BUT, in this case in not in Darwinex interest to go against traders because that damages the 'main' part of Darwinex, the exchange. I think in a way this might be good for Darwinex because with everyone becoming a Broker-Dealer Darwinex represents the only retail broker in the sector without a conflict of interest, as they are the only one that suffers if they trade against their traders. Having the flexibility to handle small and temporary pieces of Bbook is a good way to fix the LargeTraderAccount versus SmallAUM issue. If investor need 0.005 lots when the Darwin open 0.01 lots, Darwinex will be entield to wait a clearing, not only within a 100ms windows. So this could help improving replication algorithm and divergence issue. On the opposite side, the real interesting subject is large AUM issue. As usual, the mass of retail traders looser offer local liquidity (even when they seem to be liquidity consumer with market orders). Interesting question : Will Darwinex be able to reduce THA divergence using stupid traders dealing against THA during a large windows much much wider than 100 ms ? In fact, I am joking. There is no solution from Darwinex side, too many trades during few minutes to be replicated. In a way you are correct imo. Being a dealer can increase liquidity availability which could help reduce divergence with some of these bigger accounts. Although it would require some very clever algo's to be able to hold extra liquidity, foresee a big account making an entry and holding in the correct direction as to not loose on the main market. Anything that helps divergence is a good thing! So Darwinex will be the next OANDA? Will Darwinex become the next Oanda? A broker-dealer license gives Darwinex permission to make a market but it is no obligation to do so. We'll keep routing 100% of the flow directly to market. "Juan Colón – Chief Evangelizing Officer (CEO)"